R-14 Paintball, located at Range 14, Joint Base McGuire/Dix/Lakehurst (Ft. Dix), NJ, provides servicemembers from the Joint Base MDL and surrounding areas a place to relax, enjoy the scenery, and hunt each other viciously in a variety of simulated combat environments. With extensive discounts for Military, their families, friends, and groups, R-14 paintball helps servicemembers unwind through mock combat. R-14 Paintball offers players 2 speedball style fields where teams fight to capture a flag located in the middle of an arena style field within a 100' by 150' area, making for fast and furious gameplay. Those of you looking to slow the game down, take advantage of natural terrain or camouflage, will be very interested in our woodland field. The natural beauty of the fields quickly erodes away when the paint starts flying, leaving you no time to sit and enjoy your surroundings! Keep reading for additional information on pricing. R-14 Paintball also offers a fully enclosed safety area with seating and ice cold water available to keep you hydrated, and a 50 yard paintball shooting range/chronograph area to ensure all paint guns are shooting at the correct velocity, and to provide you an opportunity to show off your sharpshooting skills in front of your buddies before the games start. 1. Reservations only - No walk ons. - Must call a minimum of 7 days in advance. - Must have a minimum of 10 players. 2. 1st Saturday of month reserved for ID Card holders play. 3. 3rd Sunday reserved for Airsoft. 4. Military event discounts offered. 5. Game play is March to September. $10 - With Your Own Equipment. $25 - With Full Rental Package. 3000 PSI and Limited 4500 PSI Air Fills Free All Day! All players must have a signed wavier from the year they are playing in. Waivers are good until the Close of Business on December 31st of that year. Everyone must fill out a new waiver in January of the next year. 1. Barrel blocker must be on marker at all times when not playing. 2. Goggles must be worn at all times when in play areas. 3. Goggles and barrel blocker must be used even if you are out. 4. 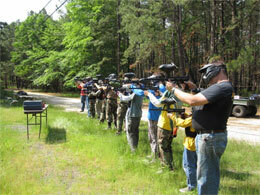 Paintball Markers must operate at no greater than 280fps. 5. Follow all directions of referees and staff.